Pav Bhaji popular street food in India. 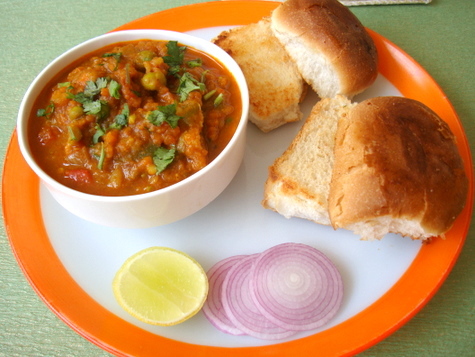 Pav Bhaji originated in Mumbai. Pav Bhaji is a quick snack available on every street corner. Heat some butter in a flat pan, add chopped onions ginger, garlic paste. Cook till the onion change in pink color. Add chopped tomatoes sauté it. Put pav bhaji masala, Kashmiri red chili powder and salt after that you will mix all vegetable and mashed potatoes. Add water as required, mix well and put tomato puree. Nicely cooked, mash them well. Add a little water if you find the mixture thick, mix it well again. Add coriander leaves to the mixture. Serve bhaji with bun, Slit the bun, apply butter and warm them same pan. Put some butter on the top of Pav Bhaji. If you like Paneer Pav Bhaji, you add cottage cheese, it is yummy.